Use these 24 games to help your students enjoy learning about social skills! These social skills games will help your students learn about, and practice, a variety of social emotional topics such as empathy, social problem solving, anger management, expected v. unexpected behaviors, self- esteem, conversation skills, feelings/emotions, positive behavior and self-control. They are the perfect way to make your social skills lessons more fun and engaging, and work well in individual, small group and classroom counseling lessons! Includes a board game with 42 role play prompts and a dice game with 6 anger management prompts. Includes 4 games to help students learn to identify and communicate their feelings and emotions. Includes 3 games to help students learn what self control is, why it’s important, and how they can use it. This resource also includes 3 lesson plans to help you add a “self control” spin to 3 of your favorite board games! Includes a role play board game with 24 prompts, a dice game and an “I Have, Who Has” to help students learn to solve their problems instead of reacting to them. Includes 3 games to help students learn the difference between these behaviors, how they make others feel and why it is important to have expected behaviors. Includes a card game with 90 game cards to help students initiate and maintain conversation while staying on topic. Also includes off topic reminder cards and a list of suggested conversation topics. Includes 3 games to help your students recognize the feelings of others and respond with empathy. 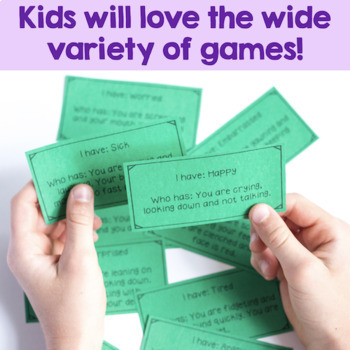 Includes 3 games to help students celebrate themselves, practice using positive self talk, and learn ways to cope when their self-esteem is low. 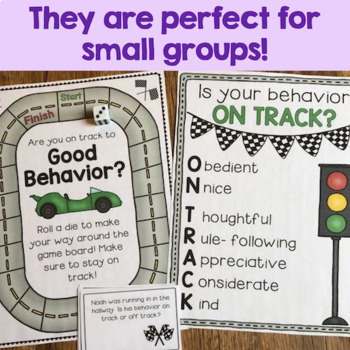 Includes a game board, 32 prompt cards, 8 game play cards and a poster/visual aid to help students identify "on track" behaviors and determine how they can use "on track" behaviors in various situations. *The "Anger Management Games" are also included in the Anger Management Bundle. **The "Feelings Games" are also included in the Feelings/Emotions Activities Bundle. ***The "Self Control" Games are also included in the Self Control Activities Bundle. 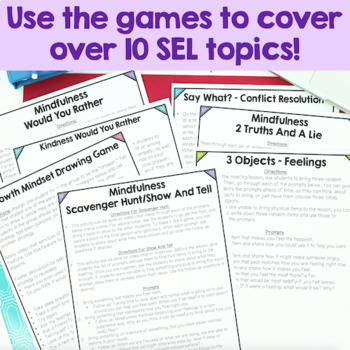 ****The "Self Esteem Games" are also included in the Self Esteem Activities Bundle. *****The "Expected And Unexpected Behavior Games" are also included in the Expected And Unexpected Behaviors Activities Bundle. 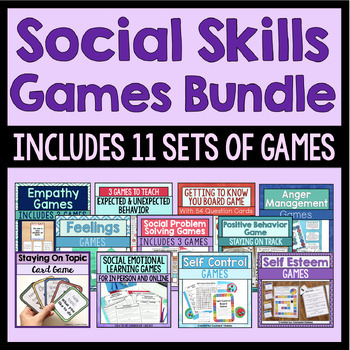 Jennifer said "This bundle is a great resource of different social skills games. I have found them wonderful to have on hand! Thanks so much!" Katie said "A great variety of games to have on hand. Thank you!"